The recent passing of Gene Wilder has left many feeling a deep sense of loss, but the way that Los Angeles is memorializing him is guaranteed to lift your spirits. In a touching tribute to the beloved actor, the Los Angeles Police Department has issued an honorary AMBER Alert for him. Wow. Now this is a truly beautiful gesture. Since approximately 8 A.M. PST this morning, the LAPD has issued an alert for all Los Angeles residents to keep an eye out for a multifaceted actor, writer, and director who is known to bring impish joy with him wherever he goes. 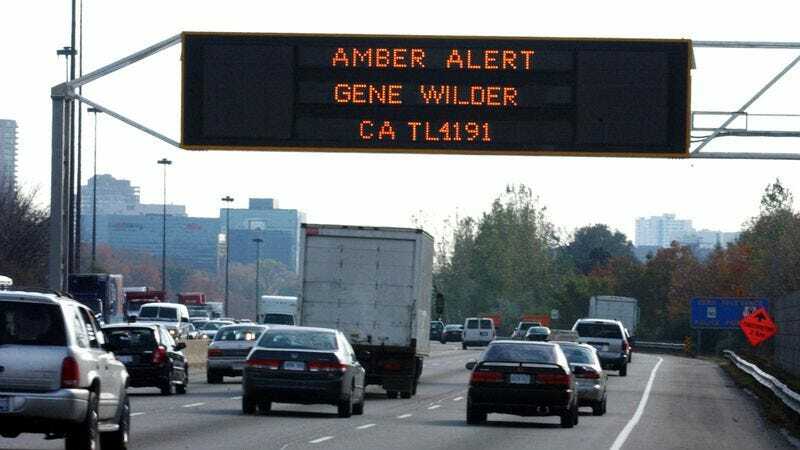 For as long as the emergency period is active, traffic condition signs above all major California freeways, including the 405 and the 101, will display physical descriptions of Wilder, in addition to his last known location. Amazing. Truly, no tribute can ever really encapsulate his many accomplishments, but with the Gene Wilder AMBER Alert also being featured on local news and radio broadcasts, and being pushed to all cell phones in the Southern California area, LAPD’s heroic search efforts definitely come close. The loss of a legend is never easy, especially one with the lasting range and talent of Gene Wilder. Thankfully, though, the incredible police officers of the city of Los Angeles are willing to help us heal, and we hope this amazing AMBER Alert is up for a long time to come.